I’m obsessed with this house around the block. I wasn’t even aware of this obsession, until my other half pointed it out one day. 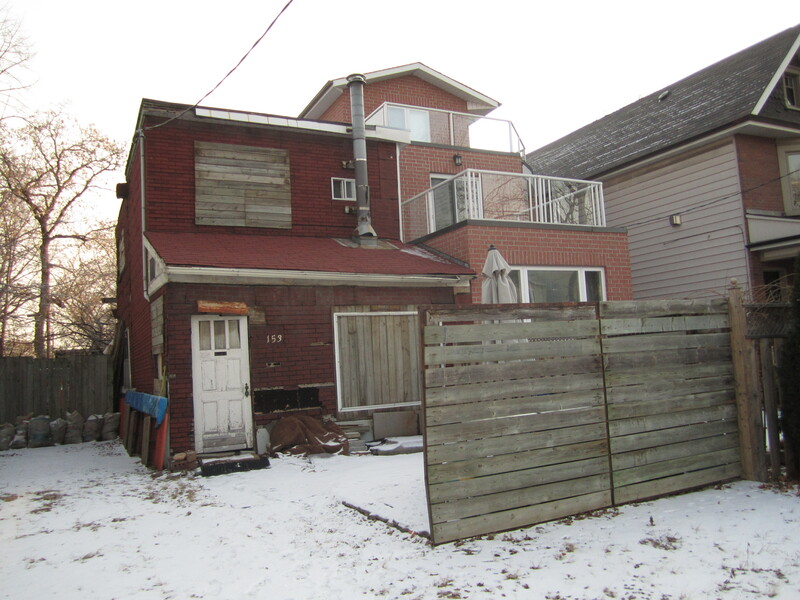 This house stands alone in a neighbourhood of single-family houses. We live in a nice enough neighbourhood in Toronto – east of the Don Valley, which is enough to be considered exotic by downtown dwellers, without vanishing into the vast wasteland of inner suburbia. The houses are thankfully lacking in aluminum siding for the most part, otherwise we would have to leave. I wouldn’t have it any other way. It’s a normal neighbourhood – there are plenty of homes still proudly displaying their Christmas decorations, despite the calendar indicating a mid-February date. There are even a few abominations sporting Halloween displays, which is kind of mind boggling. And then there is the House on Hampton. It’s boarded up, and there is a white utility van parked in the backyard. The window is missing in the upstairs washroom. I didn’t think much of this place until the snow started to fall. That was when I noticed there was delicate candlelight dancing on the snow in the backyard, a sign that something other then the neighbourhood raccoons had set up residence. Each fresh snowfall brought new sets of footsteps to the front door. Boot prints, not paw prints. The Anglican church around the corner put up a metal grate in front of a little used side door, effectively preventing the neighbourhood’s small but consistent homeless population from taking shelter from the wind. Perhaps they huddle in this forgotten home, safe from the snow? One sunny Saturday afternoon, we saw someone emerge from the front door. I tried not to stare, but I couldn’t help it. My curiosity was overwhelming. This man shuffled to a pick-up truck in the drive way, pausing to give me a hard glance. He picked up a heavy burlap sack, and shuffled back to the door. I was able to peak inside momentarily. It was dark but there was an outline of furniture, and there were snow drifts on the floor. The door clanged shut, leaving my curiosity with me. I asked my landlord about the house. He’s lived in this house for almost 20 years, and his family has lived in the area since immigrating from Greece. He shrugged. No one talks about the house. In a nosy neighbourhood, where the entire street watched me hoist a sofa up a ladder into our second floor living room, someone must know what happened there.